Once upon a time, everywhere I looked housing developers were clearing land to make room for houses and subdivisions. And when I say “clearing land”, that’s exactly what they were doing. Developers were felling practically all of the trees on a lot before the building process began, no matter the size of the tree. Afterward, they would plant a couple of specimen trees in an effort to re-green the lot. That makes little to no sense at all — especially when beneficial, 40 to 50+ year old trees are removed. Obviously, a home builder needs to remove all of the trees within the footprint of the home itself and all trees in close proximity to the home, but it’s not necessary to clear the lot — also known as clear-cutting. Trees can provide enough shade to reduce energy costs by a significant amount, as much as 30%. Trees help prevent water runoff issues. Trees reduce the amount of CO2 in the air and create oxygen as a by-product of photosynthesis. There are more great reasons to have trees around, but those are the most beneficial reasons not to crank up the chainsaw. Fortunately, there are conservation subdivisions where 50% or more of the total build-able land is set aside for green space. The University of Idaho Bioregional Planning and Community Design page is another great resource for a much more detailed understanding of the complexities and design considerations regarding conservation subdivisions… and more. They cite the Georgia Community Green Space Program that was introduced in 1999 by Governor Roy Barnes and signed into law on April 16, 2000. The artists’ rendering photo at the very top of this post depicts an actual subdivision that I found near Lithia Springs, GA. It was a very pleasant surprise, but it had also been cleared of whatever trees may have been there prior to development. 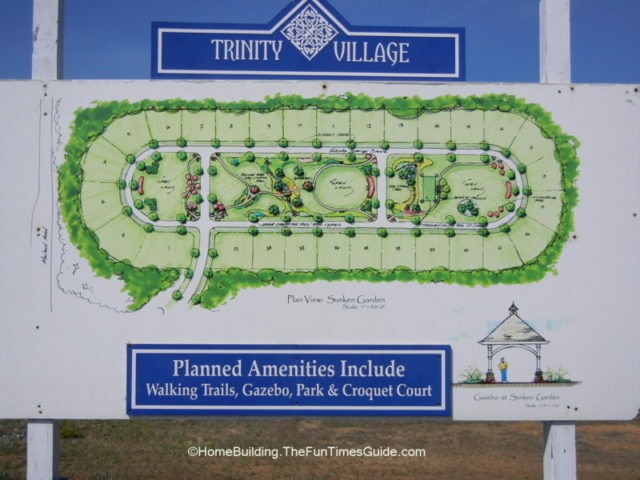 The difference is that the plan clearly shows tree-lined streets with plenty of room for neighbors to get together in a central green space to play croquet, volleyball or sit around and have a barbecue. The trees had already been planted and it looked great. Smart Communities Network is a great resource for developers and homeowners alike. It gives detailed plans and criteria for a better quality of life as it regards to green space and community. Now that many homeowners are buying homes with less square footage — whether by choice or not — they are looking for homes made of higher quality materials that are eco-friendly to benefit them and their community. Conservation subdivisions fits in with this way of thinking because it is beneficial to all members of their community and the local ecology.